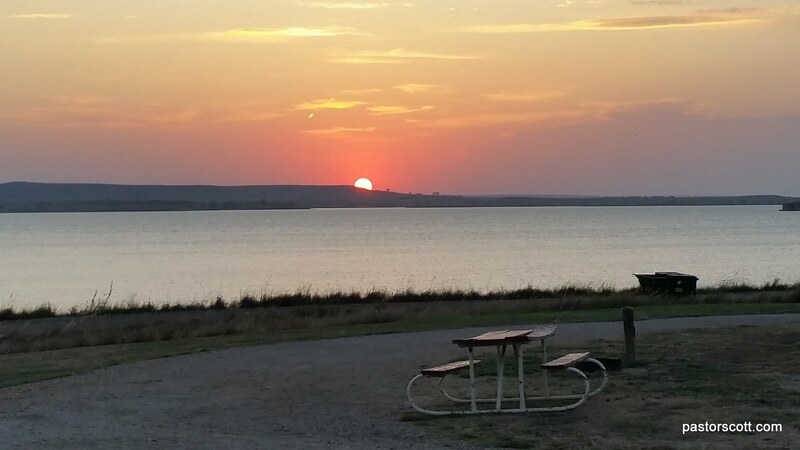 We spent four nights at Wilson State Park located in central Kansas, not far from I70. I had to smile as I realized we were in the “Hell Creek” area, but camped near Tatanka Lodge, a large shelter where church services are conducted through the summer months. This portion of the state park has a cluster of campgrounds scattered in the hills surrounding a pretty lake. The steep hills don’t match the traditional view of flat land Kansas! In our case, though, the wind very much did fit the Kansas stereotype. We had lots of hot, dry wind with gusts rocking the camper and blowing one lawn chair clear across the road. Obviously, this isn’t an everyday occurrence, but we dealt with the wind (at times over 40 mph!) our entire stay. There are only a few full hookup sites in this part of the state park and we were happily settled into one of them. 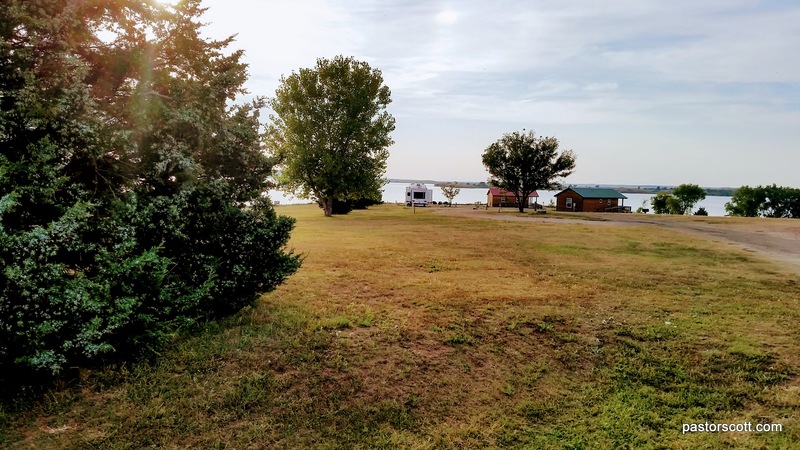 Like most places, there were very few campers present during the week, but things got busier over the weekend when every spot, including camping cabins were booked. One thing you might want to know is that above the camping fee there’s a $5 a day entry fee. There’s a nearby Corps of Engineers campground with, I think, electric only that might be a better short stay. I had no problem getting a satellite signal – keeping it was a different thing, as the strong winds tended to move the dish just enough to disrupt the signal. During one especially strong blast associated with a passing thunderstorm one of the guy wires I had put on it snapped. My Verizon had a weak but usable signal. We enjoyed the star-lit nights and beautiful sunsets over the lake. The near record temperatures and constant winds rocking the camper, though, kept us inside through much of the day. Had the weather been more enjoyable I think we would have been quite satisfied with this stop. The weather, though, caused us to look forward to calmer, cooler days elsewhere. This entry was posted in Scott and tagged camping, Kansas, review, state park, weather. Bookmark the permalink.